University Junction in Minneapolis, Minnesota is one of many hot spots in the Twin Cities area. University is located in North Minneapolis just south of BNSF's Northtown and 35th Avenue Yard, and adjacent to Canadian Pacific's Shoreham Intermodal facility. In this volume, we revisit University in the summer of 2009. BNSF and Canadian Pacific are the dominant railroads through here, along with transfer trains from the Union Pacific and Canadian National. We also take you to another interesting spot near University Junction: the St. Anthony overpass that spans BNSF's 35th Avenue Yard. At this location, you will see plenty of yard and main line activity including a Canadian National transfer with an Elgin Joliet and Eastern SD-38 dash 2. University Junction was also very busy in the summer of 2009 with Minnesota's first commuter rail train. C. Vision cameras captured several of the trains testing operations before it began service in November. We also see Southern Pacific Steam Locomotive number 4449. If you enjoy "Hot Spot" rail locations, this is one you will surely admire! Let C. Vision bring the action of University Junction into your home! Rail Buff (Southern California) on 2016-08-11 11:55:12. See my review for Volume 1, except that this volume was taken during the summer. Just more of the same. One exception, in this volume there were some yard activities shown which relieved the boredom some, but not enough to make this a keeper. UK Phil (UK) on 2010-09-01 13:27:03. This is a great dvd if you like the thumping exhaust noise from hard working slow moving big GE's. These big GEs can been seen in BNSF, CN, CP and Norfolk & Southern colours. Great crystal clear, brilliant colour photography in bright sunny conditions. 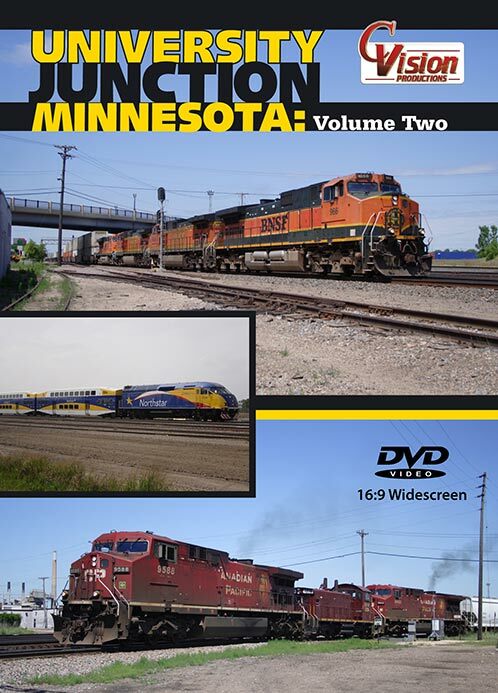 This dvd also shows rows of stored SD40-2s SD60Ms and SD75s in warbonnet, B&N green and BNSF pumpkin liveries, some rusting but awaiting their turn to work again.